You know it's Spring when the Houston Art Cars roll! Houston is the home of the first and largest of it's kind. With entries from all over the Country, it attracts an audience 300,000. 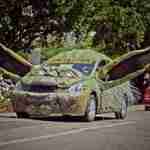 What is the Houston Art Car Parade? 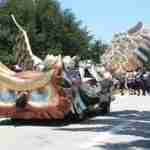 The Houston Art Car Parade, presented by The Orange Show Center for Visionary Art, is the world’s biggest celebration of Art Cars and the largest free public art event in the city of Houston. 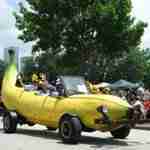 Now in its 31st year, the parade attracts over 250 cars and other entries from 23 states including Canada and Mexico and an audience of 300,000 spectators eager to see the weird and wild vehicular creations. The parade is celebrating its 31st year and is bigger than ever! Wait, what is an Art Car? 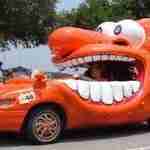 Art cars or art mobiles usually begin their lives as an older or used vehicle (car, truck, van, bus, jeep, golf cart, etc). The owner of the car decided they want to alter their automobile, not necessarily converting what’s under the hood, but instead transforming the exterior/interior of the car. Some artists approach the alteration of their cars cautiously and tentatively, opting to use materials of a temporary nature such as paper or tape, while others decide to radically change the original structure of the vehicle so that it in effect becomes a moving sculpture. When and where is it held? When: Saturday, April 14, 2018 we roll from 2pm – 4pm. The parade route opens at 11am for a perfect opportunity to see the entries up close and stationary - meet the artists! Where: The Houston Art Car parade route will start and end on Allen Parkway, winding its way east into Downtown Houston, taking a left onto Smith Street, taking another left onto Walker Street, another left onto Bagby Street, and then a right onto Dallas Street, heading back down west onto Allen Parkway, dispersing around Waugh Drive. Is there a cost to attend? No, the parade is free to the public!